Scott Morrison's 2 Billion for Climate Change — PULP. On the 25th of February, 2019, Australia’s sitting prime minister, Scott Morrison, announced that $2 Billion would be dedicated to addressing Australia carbon emissions. These resources would be dedicated to the Emission Reduction Fund (ERF), a body which was established by Tony Abbott to appease the growing concern amongst the public over Australia’s inability, or unwillingness, to meet the climate standards established by the Paris Agreement. The Coalitions decision to dedicate funds to the issue of climate change is uncharacteristic of a government which has denied the threat posed by carbon accumulation. The same coalition fought to entrench the dominant position of coal in the energy sector, evident within the ‘flexible’ concession passes which would have been afforded to energy retailers within the now scrapped NEG. The prime minister has consistently signalled his support for the energy magnates within Australia, going so far as to bring a lump of coal into parliament as a prop stating “this wont hurt you”. Despite the clear neglect of the climate shown in the past, the coalition has planned to increased the budget of the ERF to $4.55 billion, planning to deliver around 100 million tonnes of emissions reductions by 2030, according to the Department of Environment and Energy. So why is there a change of tone here from the coalition, and what does this initiative actually hope to achieve? To explore this question we will go over a few key areas of interest; the stakeholders of this policy (and the noticeably neglected), where these additional funds will be directed, and finally how effective this policy will be. What stakeholders are coming to the table. The primary function of the ERF has been to oversee the purchasing of Australian Carbon Credit Units (ACCU). These units apply a monetary value to carbon to which the Clean Energy Regulator is able to purchase in order to incentivise actors to invest in carbon capture means. These incentives are largely targeted towards farmers, businesses, and landholders. Notably excluded from this list are any actors associated to the electricity, water and gas sectors, which contribute the lion share of Australia’s annual carbon emissions, responsible for 37.7% of emissions according to the Department of Environment and Energy report of 2016. What does this money go towards? The cost to address climate change has been set by the UN, and used as a standard for national super funds, as going to cost the global economy $21 Trillion. The cost of inaction, however, stands to decimate global production by more than $33 trillion, assuming rising temperatures cap at 2.5C. Taking into account the above parameters in which these funds can be spent, the ERF’s increased budget will primarily be focused on carbon capture and drought proofing means. These efforts are not without their merits, however, have a limited capability to properly limit Australia carbon emissions. An example of what these projects look like can be seen within the ACCU’s purchased off farmers and land holders for vegetating their properties. Growth of native trees like mulga and bimblebox which store carbon in their trunks for their lifetime, is an action which will improve the resilience of ecosystems, however, does little to limit the increasing rate of emissions from our main industries. How effective will this policy be? Once you overlook the minimal funds being dedicated to this initiative, being equal to the amount of capital that the NSW state government is happy to spend on the renovation of a new sports stadium, the policy still leaves many questions. The coalition, and namely it’s head Scott Morrison, are becoming known for their confidence in being able to meet their international commitments to emissions reductions “in a canter”. This would mean that the government is able to reduce its’ emissions output by 26 - 28% by 2030. But how can this be when little to no efforts are being taken to limiting the growth and output of industry? 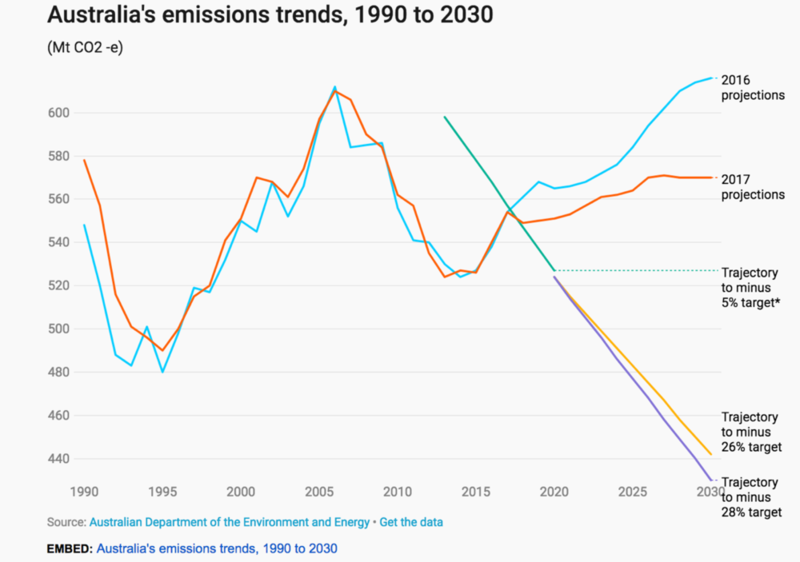 As shown by the graph provided by the Department of Environment and Energy, the output of Australia’s emissions is substantially off its targets, indicating negligible efforts to address an issue. Well now we get into the crafty loopholes which the coalition have been, and will continue to utilise in order to manufacture a narrative of its ‘successful’ management of the environment. The loophole is that the state will be counting it’s old credits left over from the Kyoto targets. Commitments which were met with some degree of excess. This effectively means that as opposed to making a commitment and investing time and resources in helping an economy adapt, the coalition has taken into account the results of past commitments and are using their success to account towards their new commitments. The counting of past efforts under the Kyoto commitments has come under criticism from prominent actors such as the Climate Council’s Professor Will Stefan. Stefan has pointed out that "This is basically an accounting fiddle,”, which leads to the problem that "Fake emission reductions aren't emission reductions at all.”. "So why should we use yet another fiddle to get even less action on climate change?” Professor Stefan poses. The current government has shown that it is willing to contort its numbers and begrudgingly commit a negligible amount of its budget to address the issue of climate change, while in the same vein it has fought tooth and nail to subsidize the Adani coal mine more than $1 Billion of Australian taxpayers money. With the federal election fast approaching in May, it has become clear that the issue of Climate Change abatement will take a front row seat in national debates. Given the position of the coalition government as being the defenders of big emitters, it is hard to see how the ERF’s increased budget will be viewed by a public. It does, however, provide a platform for other parties to define themselves in opposition to the inaction and outline more concrete solutions. Apr 17 Southern Black-throated Finch, a potential champion in the fight against Adani?